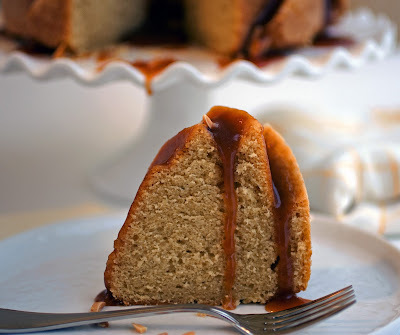 Heritage Bundt pan (which is perfect for capturing pools of the delicious caramel-nut topping). 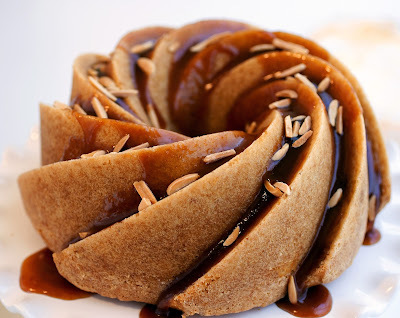 If you prefer, you can serve the caramel topping as a sauce on the side with some nuts on top and a scoop of vanilla ice cream or whipped cream. Possibly not in line with any of your New Year’s resolutions, but, hey, you’re likely to break them as some point anyway, right? Now’s as good a time as ever! 1. 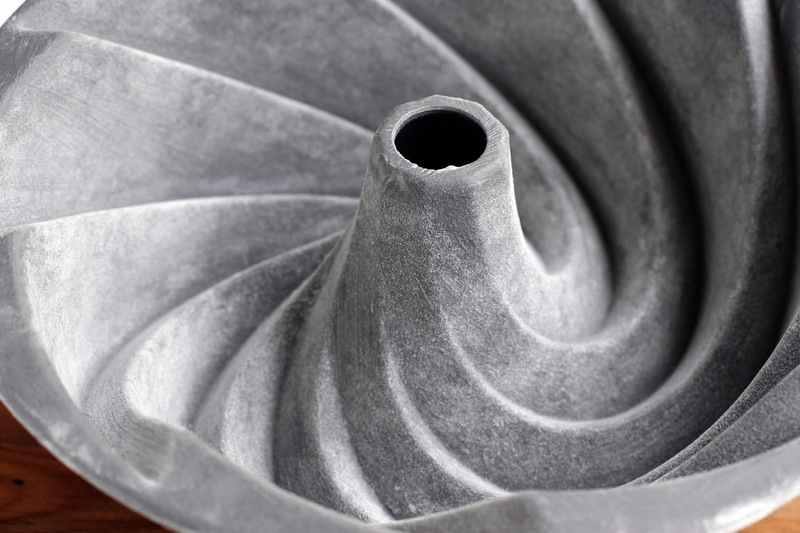 Half fill a cup with water and place a pastry brush in it (this will be used for washing down the sides of the pan to prevent crystallization). 2. In a clean, heavy-bottomed 2-quart saucepan, stir together the sugar and water. Place the saucepan over medium-high heat and cook, occasionally washing down the sides of the pan to wash away sugar crystals, until the mixture starts to color around the edges. Gently swirl the pan to ensure that the sugar caramelizes evenly. Continue to cook until the sugar turns a medium amber color. Immediately remove the pan from the heat and very slowly and carefully add the cream (the mixture will bubble up furiously), stirring with a wooden spatula or spoon until smooth. If there are any hardened bits of caramel sticking to the bottom of the pan, place the pan over medium-low heat and stir until they are dissolved. Add the butter pieces and stir occasionally until melted. Stir in the vanilla extract and salt. Transfer to a glass measure, and let stand (without stirring), until thickened (about 1 ½ hours). 3. Preheat the oven to 325°F. Butter and flour a 10-inch (12-cup) Bundt pan (I used the Nordic Ware Heritage pan). 4. In a medium bowl, sift together the flour, baking soda and salt. Set aside. 5. 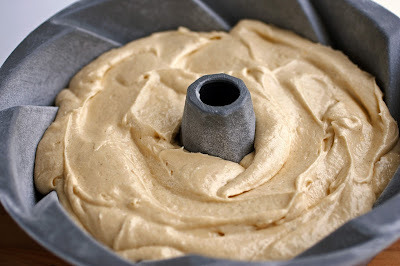 In the bowl of an electric mixer fitted with the paddle attachment, beat the butter at medium-high speed until creamy, about 1 minute. Gradually add both the sugars and beat at high speed until light, about 3 minutes. Reduce the speed to medium-low and add the eggs one at a time, mixing well after each addition and scraping down the sides of the bowl with a rubber spatula as necessary. Add the vanilla and mix until blended. Reduce the speed to low and add the dry ingredients in three additions, alternating them with the buttermilk and rum in two additions and mixing just until blended. Scrape the batter into the prepared pan and smooth the top. Bake the cake for 65 to 70 minutes, or until the cake is golden and a toothpick inserted into the center of the cake comes out clean. Cool the cake in the pan for 15 minutes. 6. Invert the cake onto a wire rack and remove the pan. Cool completely. 7. Transfer the cooled cake to a serving plate or cake stand. Stir the caramel once or twice and slowly pour it over the top of the cake, letting it pool a bit in the center. Sprinkle the almonds on top of the caramel. Serve the cake at room temperature. Store under a cake dome at room temperature for up to 4 days.